For some reason I find Scandinavian films particularly dark and bleak. Maybe it’s their weather. 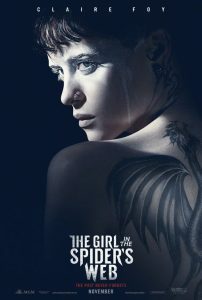 Director Fede Alvarez’s brutal retelling of Lisbeth Salander’s twisted family in The Girl in the Spiders Web is more like a female Bourne film than something as disturbing as the original 2011 English version film The Girl with the Dragon Tattoo featuring an outstanding performance by Rooney Mara opposite Daniel Craig. 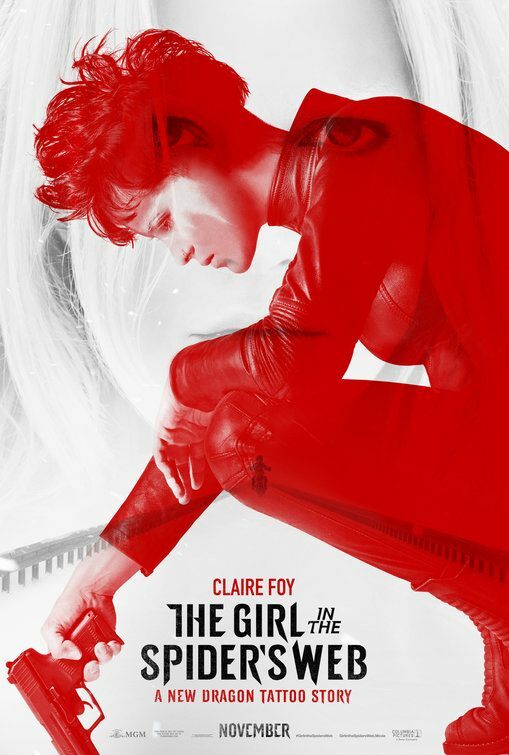 This time The Crown star Claire Foy fresh from her brilliant performance in Damien Chazelle’s First Man takes up the diverse role of Lisbeth Salander the tattooed hacker with a penchant for being one step ahead of her evil adversaries. Blade Runner 2049 star Sylvia Hoeks plays Lisbeth’s malicious sister Camilla who trots around Stockholm in a fabulous red outfit and feels nothing for slitting people’s throats. Swedish star Sverrir Gudnasson plays the young Mikael Blomkvist, the Millennium investigative journalist who comes to Lisbeth’s aid. Phantom Thread star Vicky Krieps plays a younger version of Erika Berger whose screen time is unfortunately severely limited. The Girl in the Spider’s Web is not as palatable or exciting as the 2011 film or the excellent Swedish versions of the original trilogy although Claire Foy demonstrates her range as Lisbeth Salander and her unquestionable ability to play an action star. The violence is ruthless, the plot slightly confusing especially for audiences that have not seen The Girl with the Dragon Tattoo, but this updated film gives a fresh crop of young European and British actors a chance to tackle a nefarious Swedish thriller. The Girl in the Spiders Web is really held together by Claire Foy and an exceptional Sylvia Hoeks aided by a superb performance by Christopher Convery as child prodigy and code breaker August Balder. Given the excellent cast, The Girl in the Spiders Web could have been so brilliant, but Uruguayan director Fede Alvarez doesn’t quite held the intricate thematic strands of this web together. The Girl in the Spiders Web gets a film rating of 6 out of 10 and is recommended for those that enjoy a murky Swedish thriller, which ultimately lacks panache and passion.